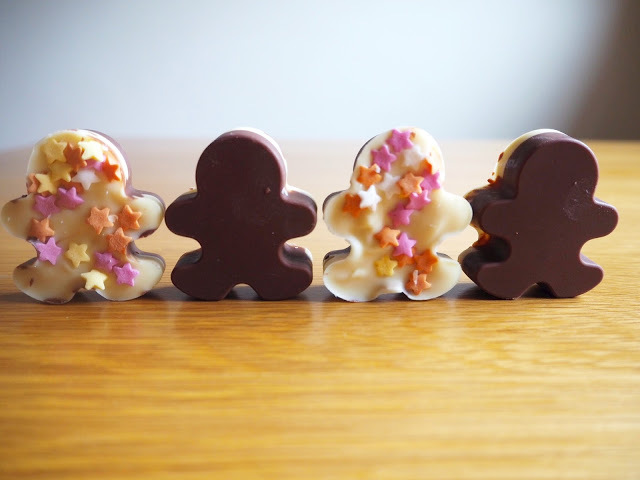 These little Peppermint Bark Gingerbread Men are very cute and very tasty! I meant to make these last year and never got round to it but luckily my peppermint extract was still in date! 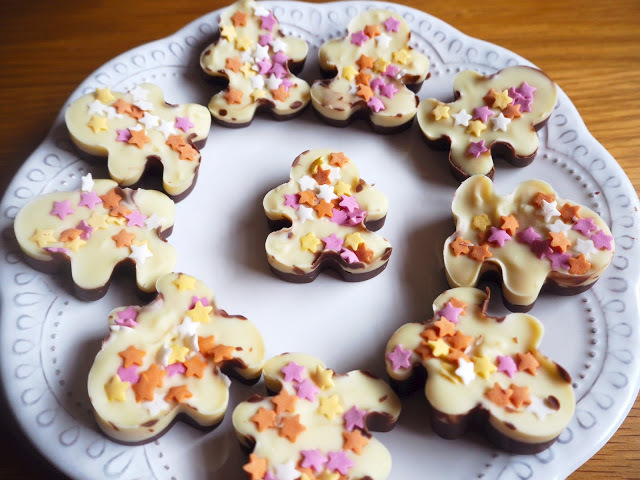 You could make these either in shaped moulds such as Snowflakes, Christmas Trees or even just line a baking tray with some grease proof paper and pour the chocolate in there and break into shards when set. 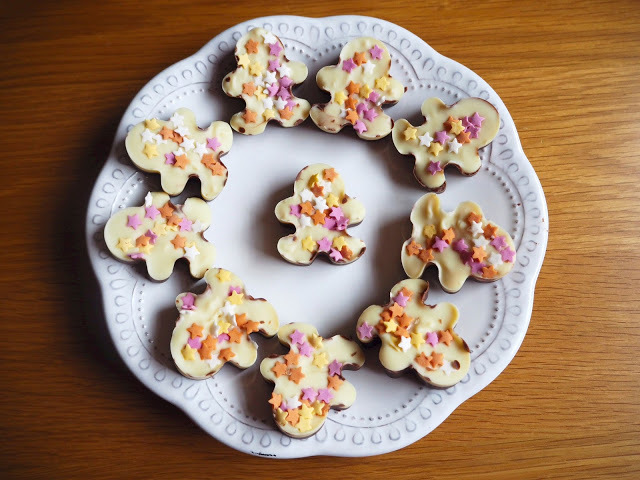 I picked up this sweet Gingerbread Men mould from Poundworld and have even used it to make shaped icecubes, perfect for your Bailey’s while you decorate the Christmas Tree or wrapping up the presents. 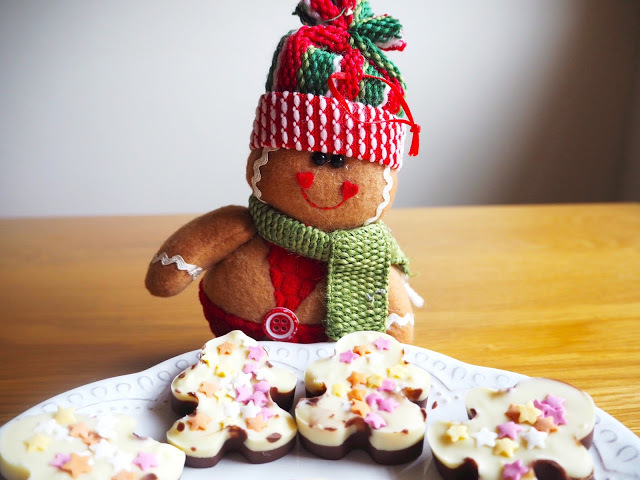 They are so easy to make and you could have these Peppermint Bark Gingerbread Men along with your Hot Chocolate or you could wrap them up all prettily and give it to a chocolate lover for an edible gift. Although I decorated mine with star sprinkles you could decorate them however you wanted, you could use those teeny tiny marshmallows that you can buy in the bakery section, red sprinkles or even holly and berry shaped sprinkles to keep in with the Christmas theme. Place a heatproof bowl over a pan of boiling water making sure the bottom of the bowl does not touch the water. 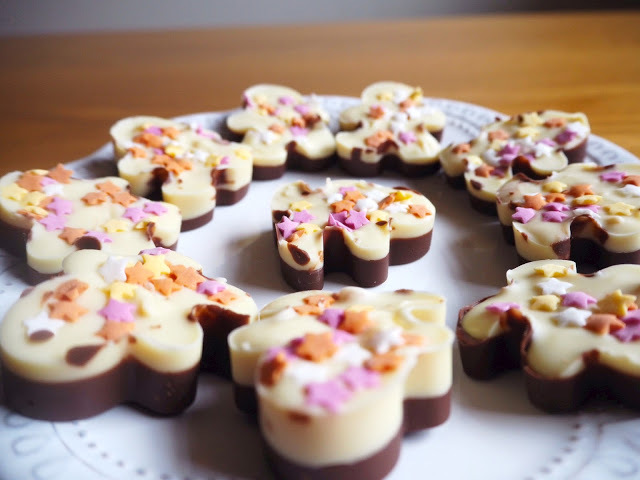 If you are using chocolate bars then break them up into smallish pieces or if like me chocolate chips, then just chuck ’em in! Keep stirring the chocolate until it has all melted. Add 1/8 Teaspoon of Peppermint Extract to the chocolate mix. I used 150g of chocolate for the first layer but it depends on how much you are making so increase the extract as required. Once it is all mixed through, spoon the chocolate into the moulds or into your grease proof lined baking tray and sprinkle some broken candy canes onto the chocolate and place in the fridge until set. Let me know if you give these a try! 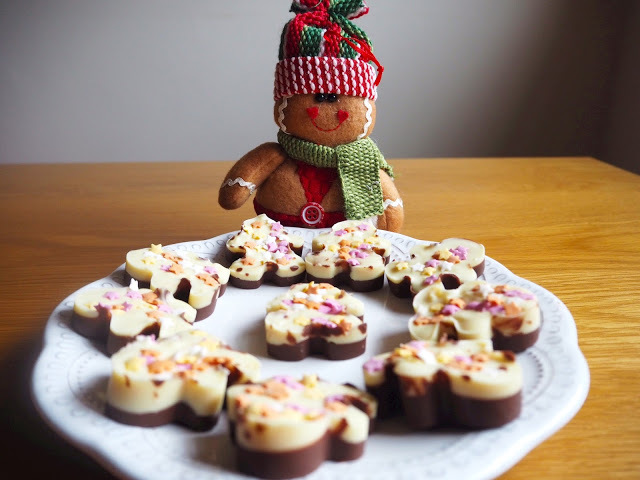 Do you give people edible gifts for Christmas or do you just keep your makes to yourself?